It has been eighteen years since I traveled Europe as one of countless college students with a backpack strapped to my back. And like any other twenty-one-year-old in Germany, I visited the Dachau concentration camp. I got up early with my roommate, got on a bus and saw what humanity could do if left to its hateful devices. It was raining, if I recall correctly, rather fitting for place. Didn’t bother with a guided tour. This was a journey I wanted to experience alone with my thoughts and my ugly brown umbrella. I walked past the site where barracks once lined the road. There are only cement blocks and trees there today as reminders. I felt sick to my stomach as I walked through the crematorium, horrified that people were burned like stacks of firewood. I spent a lot of time at the international memorial with its tangled iron, forged together to look like barb wire. It was only after I took a closer look did I realize that the barb wire was made from human forms. 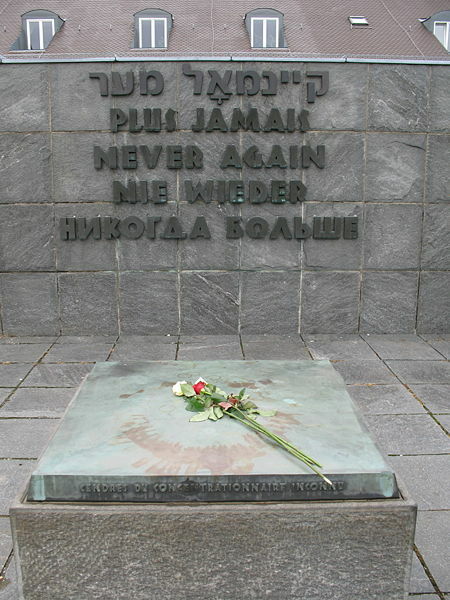 And then there was the simple phrase: Never Again written in Hebrew, French, English, German and Russian. The war was flaring in the Baltics at that time, and I prayed that we had learned from our mistakes and would not repeat history. I prayed for peace and tolerance. And yet we don’t seem to learn from our mistakes. We’re still a world of intolerance, often in the name of self-proclaimed political or religious superiority. Ethnic Muslims were still slaughtered in the Baltics in the 1990’s. I can’t count how many were slaughtered in the genocide in Rwanda. What Stalin did to his own people, or Hitler to the Jews, Roma, and others is not a new concept. Purge those who are different while wrapping yourself in the flag and proudly smiling. When one person hates, they can be signaled out as a bully. When that person hates with an audience they can go from shunned whack-job or hate-monger to a hero in a matter of moments. Remember how crazy that woman sounded during the 2008 when, while attending a John McCain town hall meeting, declared that Barack Obama was an Arab? (And by saying “Arab,” that as a buzzword to mean Muslim, which leads to the ridiculous syllogisms that equate all Muslims to terrorists.) Sounded pretty insane right? Well don’t underestimate the power of the mob mentality. Nearly one in five adult Americans now believes that Obama is a Muslim. (And I am going on record saying, even if he was, WHO CARES? There is not a constitutional ban on non-christians holding public office in the United States. God help us that it remains that way!) Again it’s fear mongering. But apparently if you through enough of anything against the wall, it will stick. Translation: Others may not feel like I do, but I’m going to do my best to plant that seed of fear so that they they think like I do. Everybody is talking about Ground Zero and the mosque. Should it be there? Should it not be there? I believe, as a nation, we’re pretty clear: You can build any house of worship wherever you want to build. But, shouldn’t we be asking a more important question? Who are the people behind this? Where are they getting the funding? What do they really believe? According to our next guest (Frank Gaffney, the same anti-Islamic president of a lobbyist group that advocated that the US military take out the Al Jazeera news network–ed. ), the imam behind the Ground Zero mosque, Imam Rauf, makes no bones about his goal to build a mosque near sacred ground and to bring Shariah to America. In other words, hide your babies and beadwork! The Evil Muslims are coming for your country! Someone once told me, it is very hard to publicly disagree with your doctor or pastor. 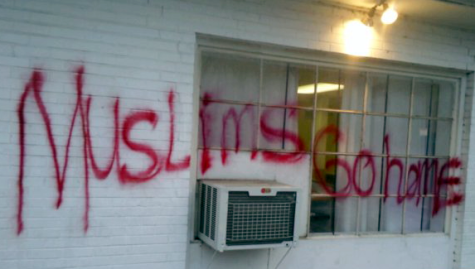 When the local clergy gang up to perpetuate stereotypes and fear, is it any surprise that Islamophobia is gaining momentum on a national level? The goal of the Jew is to make himself the ruler of humanity. Wherever he comes, he destroys works of culture. He is not a creative spirit, rather a destructive spirit. Sounds a lot like what the anti-Muslim pundits are screaming every day if you ask me. But it doesn’t stop there, the Nazi’s were very good at coming up with counterarguments like, “Religion is a private matter” or “There are decent Jews” or even, “Everything in the human race is equal.” Again, these are arguments rightfully used today when the sane try to counter these ridiculous and hateful assertions. Kurt Hillmar Eitzen’s Zehn Knüppel wider die Judenknechte outlined the propaganda with its own rules of logic (unfortunately it was the type of logic that insane trolls speak) to dehumanize the Jews. Funny how we forget how propaganda successfully manipulates the waiting mob. It can whip the mob into a frenzy and spark unspeakable violence. All it needs is a nudge in the right direction. September 11 means quite a lot to many. It is a day to mourn those who passed in the terrorist attacks. It’s a day to support the survivors, both from the actual sites and every one of us world-wide who watched the terror unfold. Shortly after the event, the United States Congress darated a bill to memorialize September 11, but President George W. Bush reinvented Patriot Day to reclaim the day from those who wanted to main and destroy us, rebranding it as a day of Nationalism and pride. It’s now a public holiday along side Memorial Day, Labor Day, Thanksgiving, Christmas, etc. Not sure if mail service is supsended that day. Coincidentally, September 11, 2010 also marks the end of the Muslim month of Ramadan, the ninth month of the Muslim year marked by, among others, fasting, prayer and reflection. I, like others worry, how these two entities will collide. And I’m not talking about attacks on America or others. I’m talking about how the mob will react to to Muslims. There is already hype for an International Burn a Quran Day on September 11. And this “celebration” (Picture me making very sarcastic air quotes.) is the brainchild of a so-called Christian preacher Terry Jones of the Dove World Outreach Center in Gainsville, Florida. It has a Facebook page that features photoshopped pictures of Iran and Mecca being destroyed by bombs. What’s not to stop people from going one step further? All it takes is a small nidus for an infection to take hold. 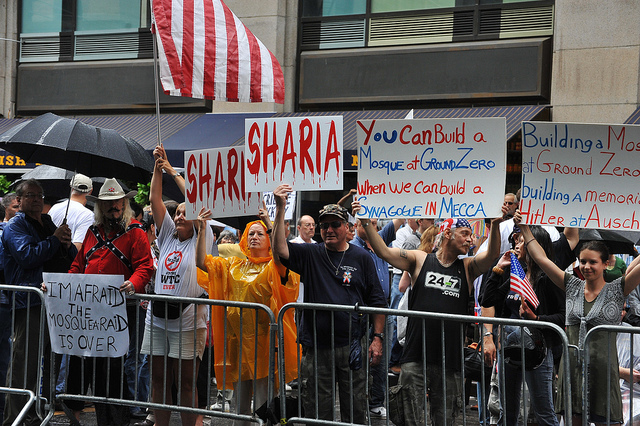 For Islamaphobes, September 11 is a rallying point. There is no question about it. Some will be clutching a cross and wrapping themselves in an American flag as the burn the Quran. What’s to stop anonymous cowards who already burned construction equipment at a building site for a future mosque in Tennessee from escalating the violence on a larger, more destructive scale? After all, it’s not the first time in humanity’s long history that houses of worship have been burned to the ground in the name of extreme nationalism. It happened quickly, and country -wide on the night of November 9, 1938 in Germany. 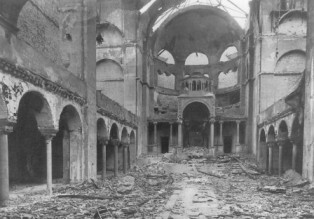 That night at least 91 Jews died, 25,000-30,000 more were arrested, 267 synogogues were destroyed in fires and thousands of Jewish homes and businesses were ransacked and destroyed. Some say it was this event that took Germany from petty pogroms to a full-blown steamroller of the Shoah that extinguished the lives of millions all in the name of nationalism and extreme religious/cultural intolerance. Are we creating the perfect storm for the Islamic version of an American Kristallnacht either through active hatred and violence, or worse yet our own apathy? How much graffiti is enough? 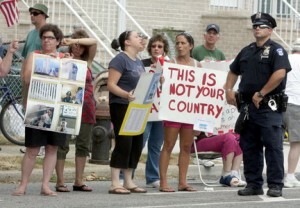 How many acts of arson will occur before “decent” Americans finally say No More, Never Again? When do we realize that we aren’t the puppets of dressed up pundits and finally put our foot down? When will we learn from our own mistakes. Neimoller’s words still ring true today. I just hope people are still willing to listen to him. For more about this, I highly recommend Rabbi Arthur Waskow’s article Qur’an Burning: The 5 Steps that Brought Us to this Point and Why Religious Communities Must Resist.